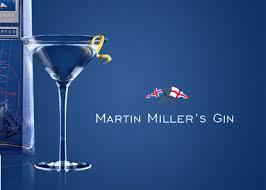 Martin Miller's makes two types of gin. The original 80 proof (40abv) was the first to be developed back in 1998 and was launched in 1999 making it the original Super Premium Gin. Made to a traditional London Dry Style in flavour profile and dryness, this gin uses a mix of ultra traditional distilling methods allied to Martin's own iconoclastic 'take' on gin distilling. In a break with tradition, there are two separate distillations for the juniper and earthier botanicals that are later 'married' or blended with a second separate distillation of the citrus elements of bitter orange peel from Seville, lemon and lime peel. These techniques contribute to the gin's unique freshness and clarity of flavour. The Westbourne strength variant was developed in 2002 to 2003 in response to requests from barmen and mixologists requesting a higher proof version of the gin. Westbourne uses the same classic palette of botanicals as the 80 proof variant - Martin abhored the use of flashy or exotic ingredients in his gin, ("sheer marketing hype" he used to scoff). In Westbourne though he made subtle alterations to their balance. The higher, 90 proof, gives the gin a little extra 'punch', making it ideal for more complex or highly flavoured cocktails. Martin wanted you to note that due to his innovative approach to gin making, and on the orders of the 'Gin Taliban' it cannot actually be called London Dry Gin. Gaz Regan wrote an informative piece about this in one of his excellent books on gin.